Need to sell or distribute reading materials? 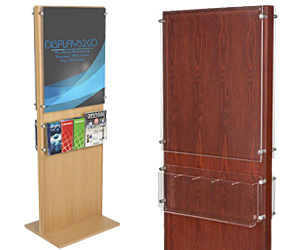 Floor standing literature holders offer strategic placement inside a small footprint. This is an important consideration for any business because pamphlet and magazine stands aren't relegated to walls or tables. 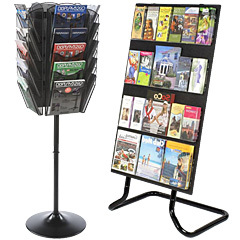 Place floor standing literature holders near entrances, in hallways, or centrally in public areas for the most exposure. Offer promotional tri-fold brochures featuring financial rates next to queue lines at banks. 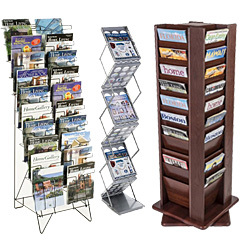 Add magazine racks in your waiting room to provide patrons a more comfortable environment. 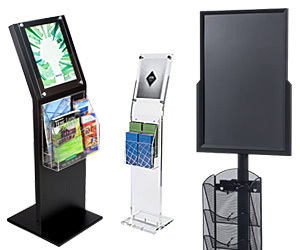 Bring a portable floor-standing literature holder for use in your trade show booth. If you've got the application, we've got you covered! 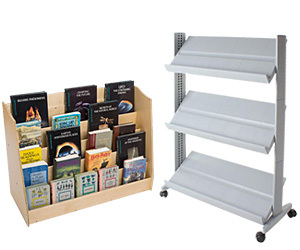 Browse our huge inventory of catalog and brochure racks, available in acrylic, metal, and wooden models. What are the three main types of stands for printed media? 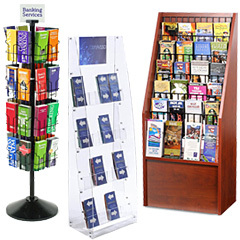 Floor standing literature holders designed to hold tri-fold pamphlets are very popular with businesses. The standard folded brochure requires a slot at least 4" wide. Whether you need a literature stand with just a few pockets or more than 40, our deep selection will be able to accommodate you. Many institutions offer free takeaway information like service plans and rates, terms and conditions, and such. Tourist and souvenir shops like to display handouts advertising local destinations. As you can see, offering free literature is one of the most important marketing tasks any business can undertake. Provide visitors or customers the convenience they need to make an informed decision! What if you have literature of different sizes to display? Floor stands with adjustable pockets are the answer. 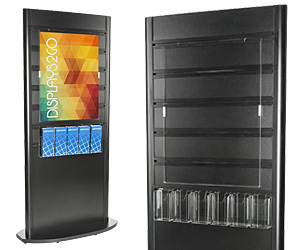 These models feature full-size slots that can hold magazines, catalogs, and other periodicals. Flexibility is provided thanks to the removable dividers. Insert one inside a wide pocket to split it in two for adding tri-fold brochures. This design is popular with customers that they don't know what sizes of reading materials they need to accommodate. 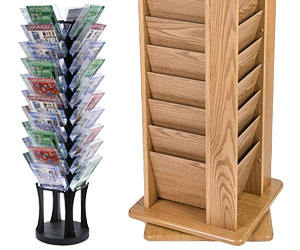 Freestanding literature holders give them the flexibility they need to display both. Floor racks expressly designed for regular-size periodicals are the choice of professionals and retailers. Have you ever seen a waiting room without a magazine holder? They perform the important task of providing patients a way to kill some time before they're called in for their appointment. Upscale wooden periodical stands are excellent choices for healthcare providers like chiropractors, dentist offices, and family practices. Convenience and drug stores, gas stations, and booksellers often sell magazines. Metal floor stands made with steel wire pockets offer rugged performance in high-traffic areas. Revolving models allow the customer to browse the selection easily. And, since they can be placed just about anywhere, displaying a periodical stand near checkout counters increases the revenue potential. In addition to the main literature holder styles, we also offer many models with specialty designs or applications. 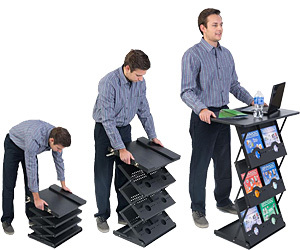 Portable catalog stands are intended for the expo. Thanks to their collapsible design, the displays can be transported to and from a show without too much trouble. 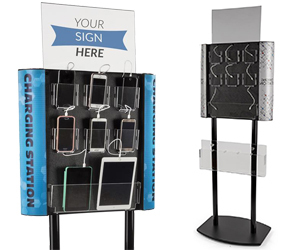 Sign stands with call-to-action graphics do a great job of advertising in front of merchandise or temporary exhibits. Providing free takeaway brochures right beneath creates a one-two marketing punch. Libraries utilize rolling book racks for easier accessibility. Children's sections in bookstores like using toddler-sized fixtures. 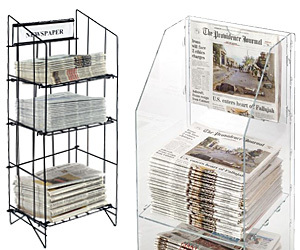 Newspaper racks give customers quick access to the day's headlines. Without a doubt, our floor stands cover all the bases when it comes to displaying a large amount of literature. Just have a couple of pamphlets to offer? Tabletop brochure pockets offer smaller sizes for smaller promotions!